Signed l.r., "W Hamilton R.A.". Not dated. Thomas Macklin, circa 1791-29 May 1801, London/England, Commissioned by Macklin. 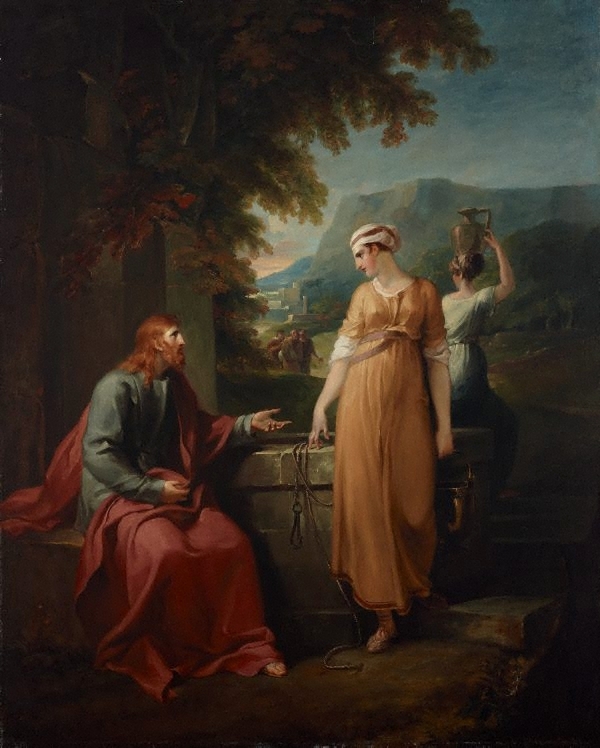 His sale, Coxe, Burrell & Foster, London, 5–10 May 1800, no 59 ('Samaritan woman at the well'), bought in; Macklin's estate sale, Peter Coxe, Burrell & Foster, 27–30 May 1801, 3rd day, 29 May 1801, no 17. Peter Stuart, pre 1881, Liverpool/England, Elm House, Seaforth, Liverpool, by 1881 (see exhibitions); presumably by descent. Christie's London, 18 Nov 1966, London/England, Purchased at Christie's, London, 18 Nov 1966, no 28, by 'Parks', 70 gns. W. & F.C. Bonham & Sons, Ltd., London, 26 Jun 1967, London/England, Purchased by Agnew's, lot 91. Agnew's, London, 26 Jun 1967-16 Jun 1970, London/England, Purchased by the AGNSW from Agnew's 1970.